Many people go through the interview process at times when they’re incredibly busy and wonder, what are the most essential things to prepare for before going on a job interview. Today we’re going to answer that question and focus on how to prepare for a job interview in 2013. 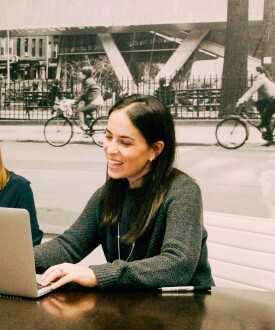 Based on new technology, hiring trends, access to information, and much more, the expectations for candidates are constantly changing, and I always take that into account when I think about interview prep. Here are 5 things you should go through and know before going to an interview in 2013. 1. 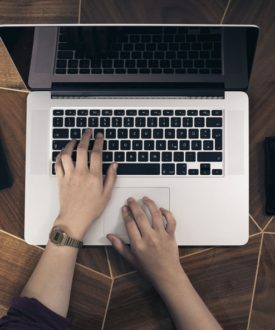 Know the job description like the back of your hand: Job descriptions are written with a lot of thought and care (and almost always published online). You will be expected to analyze them thoroughly. The job description will give you a lot of hints about what you need to prove to your interviewer. Make sure you understand the daily responsibilities of the job and can apply your experiences to it. Also make sure you understand the qualifications and that you meet many (if not all) of them. 2. Research the company and use every resource you have: In 2013 that means more than reading a company’s “about us” page. It also means checking their twitter, Facebook page, Pinterest boards, and even their Instagrams. A lot of effort is put in by companies these days to show off their brand and culture through social media, so make sure you are paying attention to it. 3. Know your interviewers: The fact that almost every working professional uses LinkedIn means you actually can get to “know” your interviewers before the interview. Take advantage of this and get to know their background, their career path, their skills & interests. By doing this, you have insight into how you might be able to connect with them (based on what you have in common). Think about it this way – if you were going on a blind date wouldn’t you do a little “research” (code for “stalking”) before going out with them? You probably would. 5. Know how to show your stuff and that might mean you show more than a resume: This part of preparation isn’t relevant for every type of interview, but if it makes sense, it is always great to show tangible evidence of what you’ve accomplished. With tiny laptops, ipads, tablets etc. you may not need to lug around a bunch of writing samples, art portfolios, or presentations you’ve made. If you do have these things to show off, consider bringing them loaded on an iPad or something similar. Then if the opportunity comes up to show off your work, you’ll have it handy. Click here to check out our checklist on what else to bring to an interview. 6. 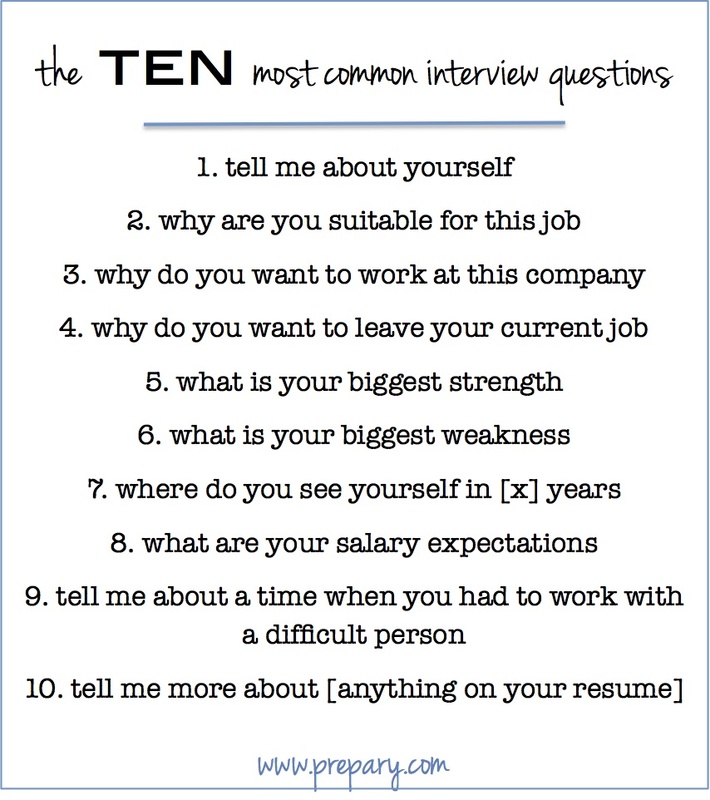 Prepare for common interview questions – Last but not least, prepare for common interview questions. These questions WILL come up and it’s always better if you’re not put on the spot. So read through them and really prepare your answers. 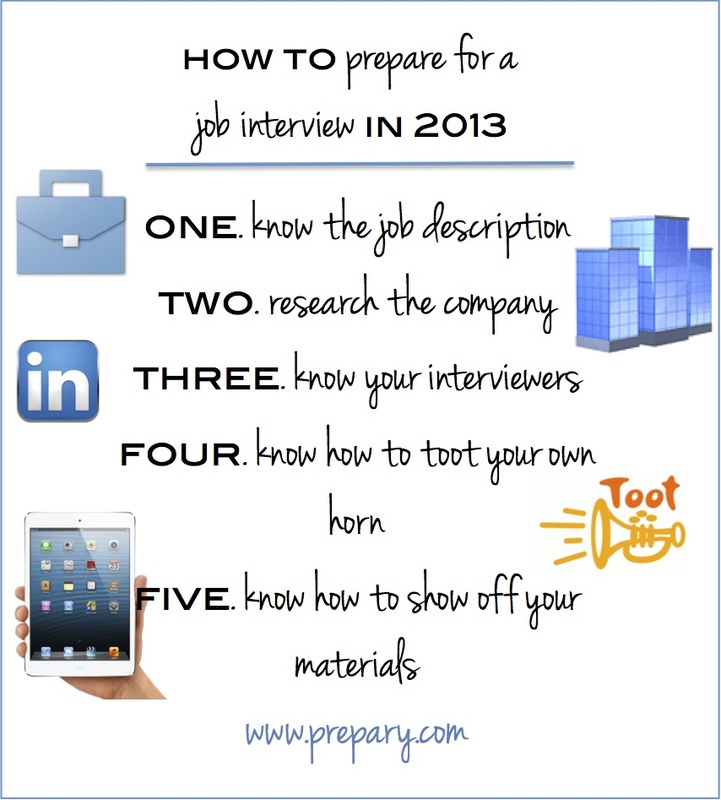 So there you have it, the most important 5 steps in preparing for an interview. Know the job, the company, the interviewers, yourself, bring some stuff along to show off, and be prepared for the common questions. It’s pretty simple when you break it down like that. Of course there are varying degrees of how much you can dive into all of the above – and (after you meet the basic qualifications) that is what will differentiate you from other candidates in the process. Of course, there’s always that pesky notion of “fit”, but after that, how much you prepare will directly correlate to how successful you are in the interview. Good luck interviewing in the new year!